Susanah L. Fink was the last child born to Daniel Fink and Elizabeth Beaver. Susan (Susanah) was born about 1846 in North Carolina and was frequently called by the name "Susan". 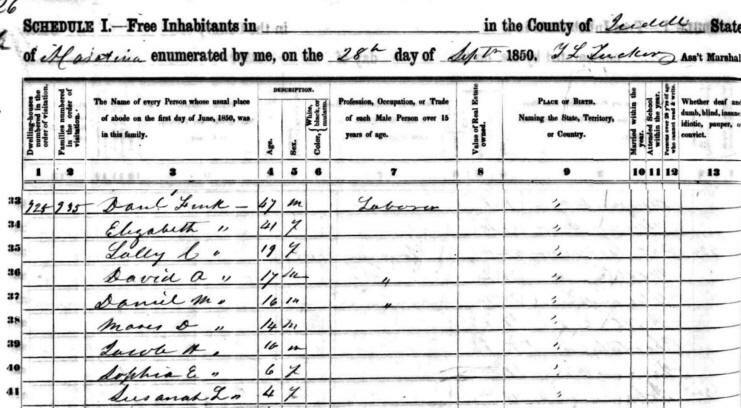 The 1850 Iredell County Census shows Susanah Fink as a 4-years-old and living at home with his parents and all of his siblings. Elizabeth " 41 F "
Sally C. " 19 M "
David A. " 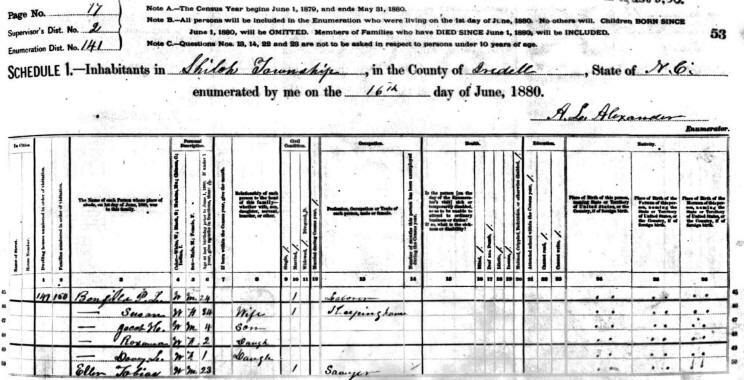 17 M " "
Daniel M. " 16 M " "
Moses D. " 14 M "
Jacob H. " 10 M "
Sophia E. " 6 F "
Susanah L. " 4 F "
The 1860 District South of the Yadkin Census for Iredell County shows that Susan was 14 years old and living at home with his parents and siblings. Older brother David Alexander had left the family home and was living by himself in the Rocky Creek District of Iredell County. Elizabeth " 50 F Wife "
Dan. M. Fink 26 M Miller Tenn.
By 1870, Susan was 24 years old and still living with her parents and sister, Sophia, in the Shiloh Township of Iredell County. Susan married Lee Benfield sometime before 1875. He was 10 years younger than her. Susan and Lee had three children: Jacob Henry, age 4(more than likely named for Susan's brother), Roxanna, age 2, and Dovey L., age 1. ----- Susan F 34 Wife M Keeping House "
----- Jacob H. M 4 Son S "
----- Roxanna F 2 Daughter S "
----- Dovey L F 1 Daughter S "
Eller Tobias M 23 M Sawyer "
Mr. Fred Benfield died at the home of his son, Lee Benfield, last Wednesday, very suddenly. Mr. Benfield was probably 80 years old. He (Lee Benfield) married a sister of Mr. Mose Fink. 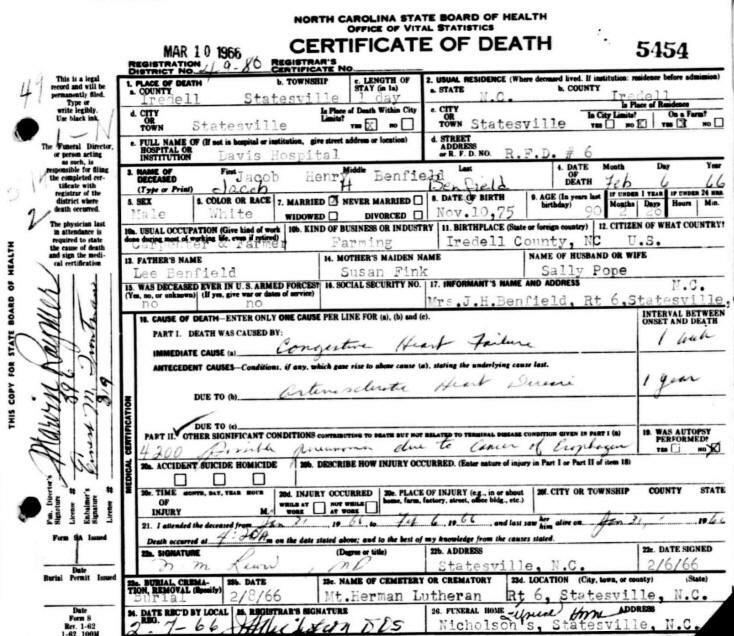 Susan Fink and Lee Benfield's son, Jacob Henry Benfield, died at the age of 90 on 06 Feb 1966 in Iredell County, NC. Jacob had married Sally Pope. James Henry "Jake" Benfield married Sarah "Sallie" Catherine Pope. Sallie was born 16 Jul 1878 and died 12 Dec 1976. Rosanna Elizabeth Benfield married John Calvin Waugh. John Calvin was born 21 Mar 1875 and died 14 Jun 1900. Dovey Levine Benfield married Preston Luckey Waugh. Preston was born on 15 Apr 1879 and died 05 Apr 1948. Minnie Benfield never married and died in an automobile accident on 04 Nov 1950. She was buried in Troutman, NC, at St. Michaels Cemetery. Thanks to Bill McKinnell for the information on the children of Susanah Fink & Lee Benfield. You can contact Bill at mckinnell3@gmail.net . If you have additional photos and information on the Fink Family, please contact me.